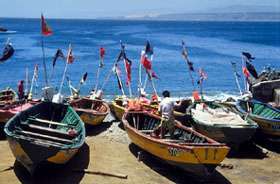 Chile has a coastline of over 3,000 miles, but at its widest is just under 200 miles. 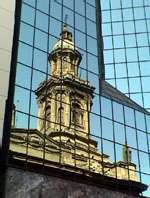 Santiago is the capital, located in the fertile central valleys bounded on the west by a coastal range of mountains and on the east by the mighty Andes Mountains, forming the frontier between Chile, Bolivia and Argentina. It is in these valleys that some of the finest wines of the Americas are produced. The Aquitania, Maipo, Cachapoal, Casablanca, Colchagua and San Fernando Valleys (just to name a few!) boast outstanding wines, each with unique characteristics created by the different microclimates. The quaint seaside resort of Vina del Mar and the intriguing Pacific port of Valparaiso are a scenic two-hour drive west of Santiago. Mysterious Easter Island lies alone out in the Pacific. The northern half of Chile is the Atacama Desert, home to rich mineral wealth as well as ancient pre-Colombian civilizations, whose relics are well-preserved in the world's driest desert. The beauty of the lush forests and pristine lakes of southern Chile, known as the Chilean Lakes Region, lure travelers from all over the world. The massive glaciers and rugged peaks of the Towers of Paine in the southernmost latitudes of the Patagonia rival the Rockies and Alaska for scenery. Day 1: Arrive Santiago, capital of Chile. Meeting service at the airport and transfer to your selected hotel. Full-Day tours via private car/van with driver & guide. Wine tours include 2 tastings. Note: Many wineries are not open on Sundays, minimum 2 pax to operate. 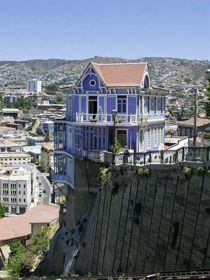 Day One: Valparaiso and Vina del Mar First stop on this two-day tour to Chile's Pacific coast is to the principal and oldest seaport, Valparaiso. Steep cog railways curve between the old houses that cling to the hillsides; the classic architecture of the nearby historic Naval Station maintains a sense of tradition in this modern port. Lunch stop (lunch is not included) at a local restaurant before driving to Vina del Mar, beach resort and the Chileans' favorite playground. Turn-of-the-century architecture faces palm-lined thoroughfares and mingles with the modern high-rises; trendy shops offer an array of elegant wares. While there, leave modern transportation behind and hire a horse-drawn Victoria. Overnight in selected hotel. Day Two: Day at leisure to enjoy Vina del Mar before your return transfer to Santiago. (B) NOTE: Transfer to Santiago Airport will have an additional surcharge. Rates Include: Motorcoach transfer Santiago hotel to Vina del Mar with Vina del Mar & Valparaiso tour with guide, accommodations in hotel of choice including tax, service & breakfast, return transfer to either Santiago hotel or airport. Rate provides for a transfer from Vina del Mar Hotel to Valparaiso Port or vice versa. Easter Island (Rapa Nui, Spanish: Isla de Pascua) is a Polynesian island in the southeastern Pacific Ocean, at the southeastern most point of the Polynesian triangle. A special territory of Chile annexed in 1888, Easter Island is widely famous for its 887 extant monumental statues, called moai, created by the early Rapanui people. It is a World Heritage Site (as determined by UNESCO) with much of the island protected within the Rapa Nui National Park. Easter Island is one of the world's most isolated inhabited islands. Its closest inhabited neighbor is Pitcairn Island, with fewer than a hundred inhabitants, 1,290 miles to the West. It is 2,180 miles west of continental Chile at its nearest point. The island is approximately 15 miles long by 7.6 miles at its widest point, with an area of 63 square miles. There are three Rano (freshwater crater lakes), at Rano Kau, Rano Raraku and Rano Aroi, near the summit of Terevaka, but no permanent streams or rivers. The climate of Easter Island is subtropical maritime. The lowest temperatures are registered in July and August (64 °F) and the highest in February (maximum temperature 82 °F), the summer season in the southern hemisphere. Winters are relatively mild. The rainiest month is April, though the island experiences year-round rainfall. As an isolated island, Easter Island is constantly exposed to winds which help to keep the temperature fairly cool. Precipitation averages 44 inches per year. 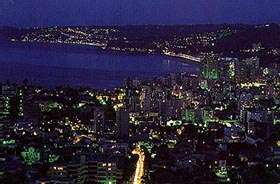 Occasionally, heavy rainfall and rainstorms strike the island, mostly in the winter months (June-August). Cyclones and hurricanes do not occur around Easter Island. This hotel is ideally located ten minutes' walking distance to the town of Hanga Roa, yet set on four secluded acres with a panoramic views of the shoreline, on one of the world's most unique destinations. Altiplanico Rapanui is designed in the style of the traditional Rapanui boathouse, with luxurious gardens, a beautiful swimming pool overlooking the sea and large open spaces to relax. The sixteen spacious, elegant rooms are independent units, linked by exterior corridors of stone, sand, or grass. Each room has a private terrace, ocean views and doorways opening directly to the outside. Privacy is ensured by each unit being surrounded with circular stone planters of varying heights and diameters, and filling them with vegetables, flowers, shrubs and trees. The bathroom shower opens to the exterior to feel nearer to nature, since the climate is very warm. Decoration is simple but careful and elegant; each room decor is unique. The restaurant is open at night, along with the bar. A single menu is offered nightly of hors d'oevres, main course, and dessert. The food is a mixture inspired by Peruvian, Chilean and above all Rapanui roots. The result is a cuisine of high quality, surprising variety, and above all, very original. The hotel is located on a hill on 24 acres of land facing the sea, about 13 miles from Hanga Roa - the only town on the island - and it will act as a base for exploring this attractive and mysterious island, home to a culture whose origins and evolution remain unexplained. Volcanic rock, native to the island and always used by the island's inhabitants in construction, and wood from the mainland are the principal building materials. The hotel has 30 guestrooms that spread out from central areas that house reception, living areas, a bar, a pool, massage salon and open-air Jacuzzis. Rates Include: Round-trip airport transfers; two half-day tours; one full-day tour with a boxed lunch; the hotel of your choice including tax, service and breakfast. All transfers and tours are basis seat-in-van/motorcoach. Airfares are available upon request. One of the giant "Moai"